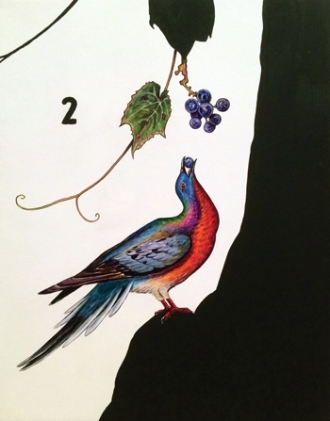 James Prosek, Passenger Pigeon and Wild Grapes, 2014, oil and acrylic on panel, 24" x 19". Sculptures included sections of white birch shaped into a perfect circle graced with a few delicate, part real–part ceramic leaves, as in an improbably curlicued antler composition that is itself a hybrid. And there were a number of exquisitely rendered watercolors, including one of a rhinoceros evoking Durer’s beast. Eel Impressions V (2014) includes an actual eel, the thin, wavelike bands suggesting a Sol LeWitt. Curated by Waqas Wajahat, Prosek’s “Walk in the Woods” playfully, subversively underscored the necessity of taxonomies and showed how protean nature outsmarts and eludes us, its essence that of flux and constant mutation. A version of this story originally appeared in the September 2015 issue of ARTnews on page 83.